Periscopulous Telescopulous (P.T.) is an astronomer who is looking through his telescope one night when he sees a strange pattern with the letter V in the sky. He determines that it is a distress call from the Planet Vee, a planet inhabited by kids. Once upon a time, these round kids with V shaped faces lived a carefree existence, dancing, singing, playing and having fun. Somehow, which is not explained in the story, P.T. finds a diary written by Doctor Starr who is the Dean of Problem Solving on Planet Cee, a planet of tiny robots, in which it is written that the President of Planet Cee had appointed Doctor Starr to help the kids on Planet Vee. When Doctor Starr and his assistant named Guy arrive on planet Vee in their spaceship, they discover that all the kids have been frozen. They take their research back home to work on a solution. How do the scientists figure out what happened to freeze the kids and can they bring them back to life? Doctor Starr will eventually choose five kids to teach the kids on Planet Vee that a healthy mind and body is the secret to good living. Continuing his research, the doctor decides that he will bring his plan to planet Earth, where many children would benefit from his advice. This tale targets children in the two through seven age group and is written in rhyme. I think it might have been just as effective if written in prose because the rhyme is sometimes forced. 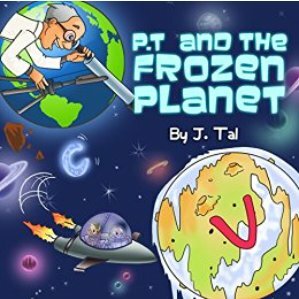 At just over fifty pages, the length of this story is a bit long for preschoolers though young children will enjoy the colorful illustrations of the characters and scenery of the planets. The message of combining good nutrition and proper exercise is much needed and presented in an enjoyable way for kids. I would especially recommend this book for children in the five to seven year age range.